Doing random acts of kindness with your family can get kind of addicting. It’s not only a great way to teach kids about empathy and service it’s also an immediate mood booster that can help turn a day around, especially when it’s easy to do. And better yet this simple act of kindness can be done for just pennies–it really is the easiest random act of kindness ever! 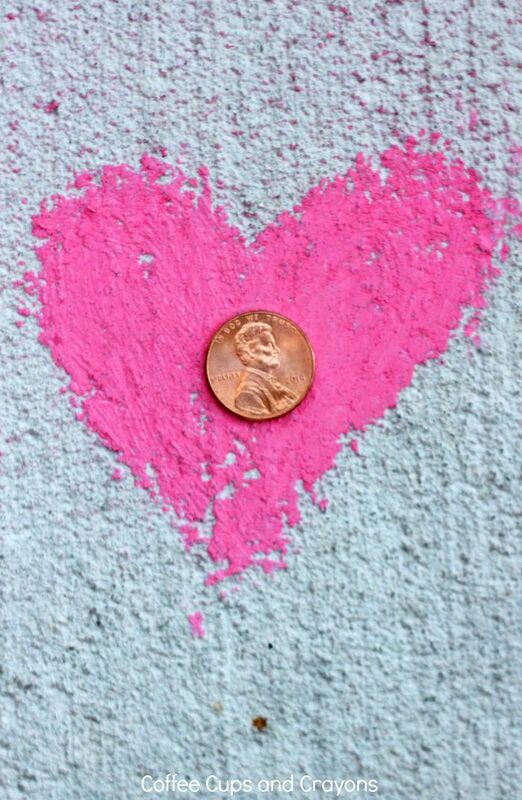 Our inspiration for this kindness act was an old saying, “Find a penny, pick it up, and all day you’ll have good luck!” Remember that one? Well, we decided to surprise some strangers with some heads up pennies for luck. 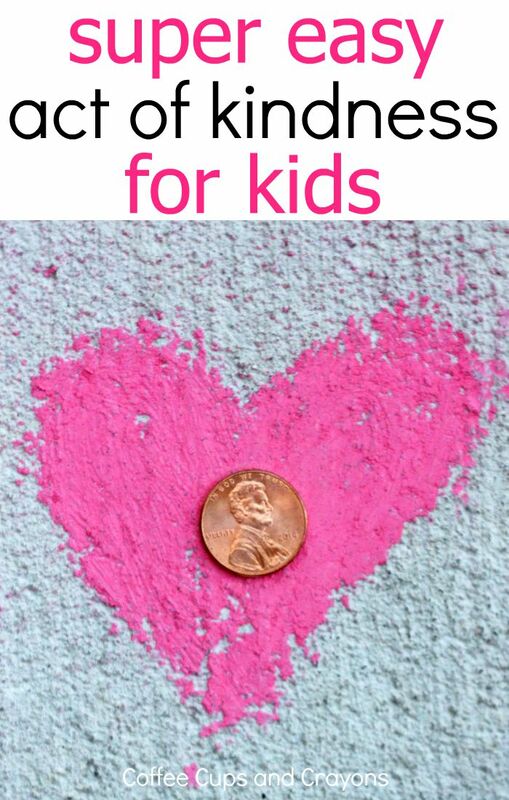 The only supply you need for this easy act of kindness are some pennies, even just one will do! We have a bunch in the change holder in our mini-van that we never end up need for anything else so we just use those. 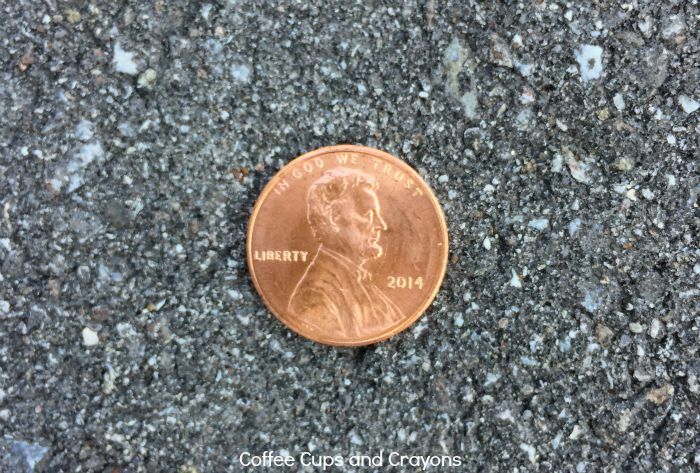 All you need to do is leave a heads-side up penny on a sidewalk, parking lot, walking path, etc. That’s it! Totally simple. In fact it’s so simple this is one of those posts I almost didn’t even write. But we have so much fun doing it. And the other day when they were getting a little cranky in the back seat I announced that when we stopped we were going to do some penny acts of kindness the entire mood of the car changed. Instead of feeling frustrated they began to focus on where the best place to leave their penny would be. Just like that a simple penny turned around our day even though we were the ones giving it away. So I’m sharing it because when something like a penny has that kind of power you just can’t keep it to yourself! Oh, one more thing. My kids don’t just leave the penny heads up. They toss it in the air and see how it lands…and every single time it’s been heads up so far! If you are interested in doing even more acts of kindness with your kids or class be sure to check out all of my acts of kindness posts! I would like to receive Megan Sheakoski’s newsletter. She’s such an inspiration to everyone. Her ideas in which to bring a positive environment to children and whomever they touch is so paramount in today’s world. Hi Denise! You are so sweet! Thank you for your kind words! You can sign up for the newsletter here: https://www.coffeecupsandcrayons.com/subscribe/? Have a great day! would love the newsletter! Also, will there be a Random Acts of Kindness for Christmas? Yes! My goal is to have a new RACK calendar out for 2015 in week or two! Great! Just go here and enter your info! https://www.coffeecupsandcrayons.com/subscribe/?